This article is about the American food chain. For the Swiss automobile producer, see Sbarro (automobile). Sbarro was founded in 1956 by Gennaro and Carmela Sbarro. The couple and their three sons, Joseph, Mario, and Anthony, immigrated to America from Naples, Italy. The same year, the Sbarro family opened their first salumeria (an Italian grocery store) at 1701 65th Street and 17th Avenue in Bensonhurst, Brooklyn, New York, which became popular for its fresh food and Italian fare. Its original location closed down in 2004. The success of the Sbarro Salumeria led to the opening of additional locations in the New York City metropolitan area. In 1970, Sbarro opened its first mall-based restaurant in Brooklyn's Kings Plaza Shopping Center. One of their busiest outlets was located in the World Trade Center mall, though it was destroyed in the September 11th, 2001 attacks. In early 2007, Sbarro was acquired by MidOcean Partners, a private equity firm with offices in New York and London. The company filed for Chapter 11 bankruptcy protection on April 4, 2011. At the time it was ranked by Pizza Today as the country's fifth-largest pizza chain. It was the third-largest pizza chain to declare bankruptcy in less than a year. Earlier, Round Table Pizza (ranked no. 10) and Uno Chicago Grill (ranked no. 11), through its parent Uno Restaurant Holdings, filed bankruptcy. Uno has since reemerged. In November 2011, Sbarro was granted court approval to emerge from bankruptcy under a plan requiring restructuring and ceding ownership to lenders; 25 sites were closed. In January 2012, James J. Greco was brought in CEO of Sbarro to implement a turnaround plan as the company emerged from bankruptcy. Sbarro rebranded, updating its pizza recipe, food offerings, and branding, bringing fresh ingredients back to the forefront of the menu. On March 15, 2012, Sbarro announced a franchise agreement with Upper Crust Foods Pvt. Ltd. to open restaurants in the Indian state of Maharashtra. The franchisee will develop and operate the restaurants. The first outlet opened in Chembur, Mumbai. In July 2015 Sbarro announced that they planned to expand to 50 outlets in two years, from the 17 they had then. In March 2013, Sbarro announced that J. David Karam would be the next CEO of the company. In March of the following year, the company again filed for Chapter 11 bankruptcy protection. 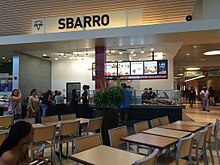 Sbarro announced on June 3, 2014, that they had exited from bankruptcy protection on June 2 based on a reorganization plan as approved by the court on May 19. 182 locations were closed and the company announced plans to move its headquarters from New York City to Columbus, Ohio. In January 2015, Sbarro's logo changed from a design resembling the Italian national flag, to an outline of a pizza slice in red and green, with the words "NYC.1956" to recollect the establishment's Brooklyn origins. In 2016 Sbarro had 318 locations in the U.S., less than half of 12 years earlier. The decline of mall food courts and changing dietary choices among Americans are felt to be the major factors in Sbarro's regression. In October 2013, Sbarro opened the first location of their fast-casual concept called Cucinova. The restaurants feature Neapolitan-style pizzas made to order with fresh, high-end ingredients and baked in woodstone ovens in under three minutes. Cucinova has multiple locations in Ohio and Illinois. In a scene from the hip-hop film Krush Groove (1985), Sbarro (portrayed as an "all you can eat buffet") falls victim to a ravenous eating frenzy by the infamous corpulent rap trio The Fat Boys. This scene and the restaurant was also the setting for The Fat Boys hit music video for their song "All You Can Eat" which is featured on the Krush Groove movie soundtrack. Sbarro was featured in the season 2 episode "Valentine's Day" of the American television series The Office. While Michael Scott was in New York City on a business trip, he eats pizza at Sbarro, which he claims is his "favorite New York pizza joint". ^ "11 Worst Fast Food Restaurants in America". The Fiscal Times. Retrieved 2018-08-04. ^ "The state of Sbarro: America's least essential restaurant". Slate Magazine. Retrieved October 20, 2015. ^ "About Sbarro - Get the Story Behind the Slice". Retrieved August 7, 2018. ^ "History". Sbarro, Inc. Archived from the original on August 10, 2007. ^ "Sbarro Chapter 11 Petition" (PDF). PacerMonitor. PacerMonitor. Retrieved 9 May 2016. ^ Kary, Tiffany (April 4, 2011). "Sbarro, Mall Restaurant Chain, Seeks Bankruptcy Protection". Bloomberg. Retrieved April 11, 2011. ^ a b Karp, Gregory (April 10, 2011). "Pizza restaurants feeling bite from consumer options". Los Angeles Times. ^ "James Greco, former Bruegger's CEO, joins Sbarro". www.fastcasual.com. Retrieved October 20, 2015. ^ "Sbarro Restaurant Company Fights Back From Bankruptcy - QSR magazine". qsrmagazine.com. Retrieved October 20, 2015. ^ Strom, Stephanie. "New Sbarro Pizza Recipe to Drive Chain's Turnaround Plans". Retrieved August 7, 2018. ^ "Sbarro - News". February 10, 2014. Retrieved August 7, 2018. ^ "Franchise India - Business Opportunities, Franchise Opportunities". franchiseindia.com. Retrieved January 18, 2017. ^ "Restaurant Review: Panki, Sbarro". March 23, 2012. Retrieved August 7, 2018. ^ "Pizza Chain Sbarro to Raise Store Count to 50 in 2 Years - NDTV Food". Retrieved July 21, 2015. ^ "Is There Life After the Mall for Sbarro?". Eater. Retrieved 2018-02-25. ^ "DEATH OF THE FOOD COURT: Iconic mall chains like Cinnabon, Sbarro, and Panda Express are transforming to survive". Business Insider. Retrieved 2018-02-25. ^ "New fast-casual pizza concept coming to Kenwood: EXCLUSIVE". Cincinnati Business Courier. October 14, 2013. Retrieved October 20, 2015. Wikimedia Commons has media related to Sbarro.